Police Departments across the country participate in the national Pink Patch Project, raising money for Breast Cancer Awareness through the Pink Lemonade Project. Each group has a pink patch designed for their shirts and they wear the shirts during October. This year the Ridgefield Police Department had patches made and the Police Officers Association paid to buy shirts to hold the patches so they wouldn’t have to remove that patches on their uniform shirts. They bought 100 patches as a test, and sold the ones that weren’t used by the officers. The group that sold the most patches were the folks at Todd’s Corner Marketplace. Thanks gang! Each year a new patch will be designed so they will become collectibles. 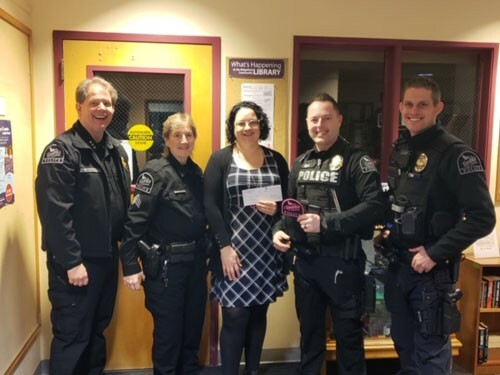 Representatives from the Police Department presented a check for about $770 to the Director of the Pink Lemonade Project, Meaghann Ande. In the past 7 months, the Ridgefield Police have received three calls of a white van with the driver attempting to make contact with young people. Each instance occurred in the afternoon, between 2:30 and 5 pm. The vehicle is described as an all-white work van with no windows, unknown license plate and possibly no plate at all. The van was seen in the Pioneer Canyon area and the Hillhurst/Sevier road area. The driver is described as an African-American male, 28 to 35 years old. Residents are asked to call 911 if they observe any suspicious circumstances. In light of suspicious activity, please review the following safety tips with your children. Don’t take anything from strangers. Don’t go anywhere with someone you don’t know. Stay more than an arm’s reach from strangers. If you are approached by a stranger, seek help immediately. Trust your instincts, if you feel you are being followed or something is not right, seek help immediately. Review contact telephone numbers and home safety practices. A good crowd turned out at the Community Center to welcome Chief John Brooks to our Police Department. Julie Basarab did the swearing-in ceremony. His wife Alisha and children Sasha and Maria Ann pinned on his badge and other marks of his office. John gave a short talk after the ceremony, saying how happy he is to be in Ridgefield. He is impressed with how everyone here works together – said that when someone needs something heavy to be moved they just call on the football team. Welcom John Brooks, from all of us. The City of Ridgefield will host a community welcoming reception for its new Police Chief, John Brooks, on Wednesday, October 12th at the Ridgefield Community Center from 5:00-6:30PM. The reception will include an official swearing-in ceremony and provide an opportunity for citizens to meet Mr. Brooks. Members of the public are invited to attend. Mr. Brooks will begin employment with the City of Ridgefield on October 3rd after 25 years of service with the Portland Police Bureau where he worked his way through the ranks from police officer to Captain. The City is enthusiastic about Mr. Brooks’ coming to Ridgefield. Steve Stuart, City Manager, said he “has the law enforcement background, high-energy engaged and collaborate leadership style and vision” to manage the police department and meet the needs of our growing city. Mr. Brooks is replacing Carrie Greene, who resigned her employment and retired from law enforcement after nearly 10 years as Chief of the Ridgefield Police Department and 35+ years of police service. The reception was rescheduled from Tuesday, October 4th due to a conflict with a Ridgefield School District community forum. The School District is hosting the community forum on Tuesday, October 4 at Ridgefield High School from 5:30 – 7:00 p.m., to provide citizens an opportunity to learn more about the 2017 bond. The City of Ridgefield is encouraging citizens to attend. The City of Ridgefield is pleased to announce that Garry Lucas, retired Clark County Sheriff, has been selected to serve as Interim Police Chief for its Police Department. Mr. Lucas will assume the position being vacated by Carrie Greene, who is retiring effective May 6, 2016. He will manage the administrative operations of the Ridgefield Police Department until the City makes a decision on a more permanent replacement. Mr. Lucas retired from the Clark County Sheriff’s Office (CCSO) on December 31, 2014 after 47 years of service including 24 as Sheriff. At CCSO, Mr. Lucas worked his way up through the ranks from a graveyard deputy patrolling North County to Chief Criminal Deputy before becoming Sheriff. As Chief Criminal Deputy, Mr. Lucas helped CCSO become the 31st law enforcement agency in the country to become nationally accredited. Since his retirement, Mr. Lucas has remained an active member in the law enforcement community including an appointment to the Commission on Accreditation for Law Enforcement Agencies, which sets national standards for police agencies. He hopes that his long experience in law enforcement will bring additional benefit to the growing and professional department. “Mr. Lucas has a wealth of management and police experience that will serve the department and the citizens of Ridgefield,” said City Manager Steve Stuart. “The City appreciates the community’s support in welcoming Mr. Lucas to the Ridgefield Police Department and looks forward to his leadership, knowledge and experience. Officer David Bone of the Ridgefield Police Department was among the people honored at the American Red Cross Heroes Award breakfast on Friday. While on patrol, Bone spotted a woman running into the street waving her hands. He followed her to a parking lot and learned from a dispatcher that there was a woman there in imminent childbirth. He got to the parked car in time to catch the baby. Bone, a paramedic prior to becoming a police officer, slipped the tangled umbilical cord off the baby’s neck. Ridgefield Police Department is looking for a lateral entry police officer. To be eligible for consideration, applications as well as written and physical ability testing must be completed before January 31, 2016. THE POSITION: Police Officer is a full time, regular, non-exempt position. The position is covered under the terms of the collective bargaining agreement between Ridgefield Police Officers Association and the City of Ridgefield and is a Civil Service Classified Position. THE DEPARTMENT: The Ridgefield Police Department provides 24 hour, 7 day a week, 365 day coverage with a budgeted staff of six police officers, two Sergeants, one Lieutenant and the Chief of Police. Calls for emergency service are dispatched to officers in the field by the Clark Regional Emergency Services Agency (CRESA) over an 800 MHZ radio system. Officers work four 11-hour shifts with four days off, with one extra day of training evry other month. Officers rotate shifts between day, swing and graveyard every four (4) months. The department is fortunate to experience a good working relationship with residents and the local business community, and continues to further strengthen those relationships through the implementation of neighborhood programs and community partnerships. Additional information about the department can be found by clicking here. Have the ability to read and write the English language. Possess a valid Washington Driver’s License within two weeks of appointment. Have graduated from an accredited high school or possess a certificate of equivalency. Successful completion of a state certified basic law enforcement academy. A candidate who has a break in continuous law enforcement service following completion of the Academy will not be eligible for lateral entry. HOW TO APPLY: Initial testing including written and physical ability exams are performed by Public Safety Testing. To schedule an exam time and to obtain additional information about the position, visit www.publicsafetytesting.com. For the second year, Chief Carrie Greene is asking that no chairs be put on on Main or Pioneer before 6:00pm on Friday, July 3. This worked well last year – please follow the rules again this year. We have a new resident! Ridgefield, WA, June 17, 2015 –This morning around 7:30am while on routine patrol, Ridgefield Police Officer David Bone was frantically flagged down by a woman in the IQ Credit Union parking lot, who indicated her female passenger was in labor and about to give birth. Officer Bone proceeded to the car and was preparing to assist the woman lying in the front seat, when it was apparent the baby was delivering immediately. Officer Bone caught the baby boy, initiated its breathing and held him until medics arrived a few minutes later. Both mother and baby were then transported to the hospital. This is the third child for parents Aja and Seth Shelton, new residents to Ridgefield. They had been with friends when she was urged to go to the hospital to be checked out. According to Seth, the due date wasn’t until July 11th, but their new son had other plans and came early, the same schedule their other two sons followed, both also arriving two to three weeks ahead of their due dates. He said everyone is fine and very thankful for Officer Bone being in the area and able to help. Officer Bone has helped deliver babies before when he was a paramedic in California but this is the first delivery since being with Ridgefield Police. He felt very fortunate to be in the area at the right time to assist with the birth. “This is the cool part of our job, it was very special,” said Officer Bone. The Ridgefield Police Departments reports some money has been found in the vicinity of the police department. If you believe it’s yours, please contact the police department at 887-3556 to claim it. Ridgefield Police Department recently caught a car prowler in the act! The investigation confirmed that the thefts were from unlocked cars with valuable items in plain sight. When a thief prowls and easily finds unlocked cars, they not only take the valuables but they also come back to the area for more. Please help to prevent car prowls by locking your car. 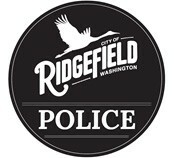 And, thank you Ridgefield Police for keeping our community safe. Cathy Dorio t was promoted to sergeant of the Ridgefield Police Department at a ceremony last night at the City Council meeting. Cathy is a long-time member of the force, and is the first person to serve in that position. Chief Carrie Greene praised her work and several in the audience spoke highly of Cathy. Cathy grew up in Ridgefield. The photo shows Julie Basarab issuing the oath of office. At approximately 9:00 AM Monday, October 13, 2014, a City of Ridgefield vehicle was stolen from near Overlook Park in downtown Ridgefield. Shortly thereafter, an interested citizen contacted City Hall to report a City vehicle driving erratically near the Ridgefield on-ramp to I-5 South. The stolen vehicle is a white 2013 Ford F150 open-bed pick-up truck with the City of Ridgefield logo on the door. The license plate is Washington 48617D. The Ridgefield Police Department is actively investigating the theft. Police ask anyone with information about the incident or the stolen vehicle to contact the Police Department at 360-887-3556.